Just because it seems like I haven’t doesn’t mean that is the case. 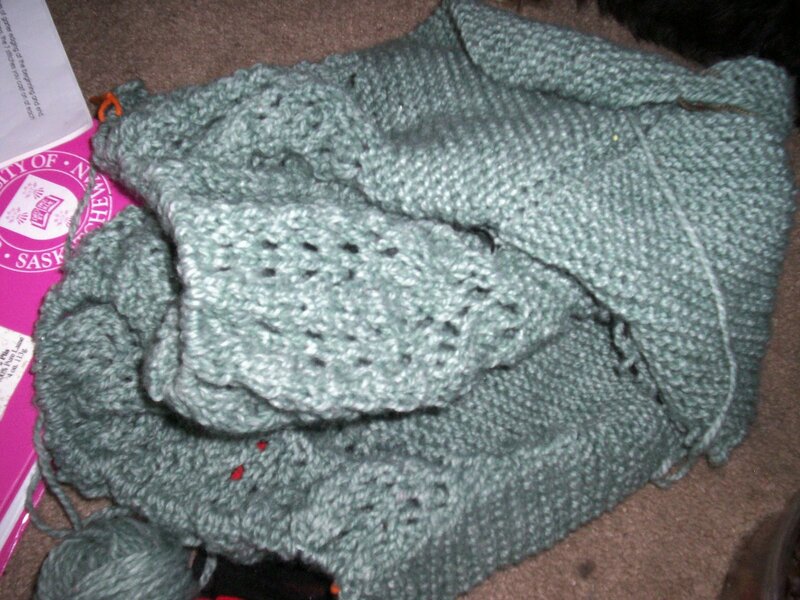 The February Lady Sweater is still on the needles and I’m almost done the body, it just takes so frelling long. Seriously. It’s out of a recycled sweater that I found at the Value Village. The sweater itself was hideous so I felt no remorse (except maybe that someone worked hard on the orginal sweater only to have it discarded to VV). I’m guessing by the amount I have at the moment that it’s going to be a three-quarter lenght sleeve that I go with for the sleeves. It seems everytime it gets warm I want to spin, spinning and spring/summer go hand in hand in my world, I have no idea why. But I have been spinning a lot lately. 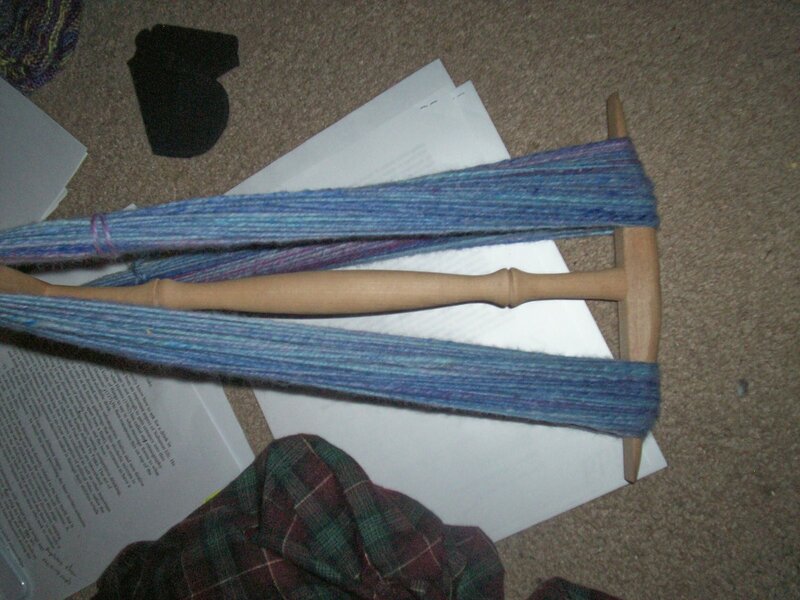 Here is the skein of the lovely stuff I did at spinning day (navajo plyed and weightin in at 4. something oz). I call it “Sparkle Motion”, and if you catch that referance know that I love you. When there’s papers due, and the power goes out, I turn to…. carding. Around 2 pm this afternoon the power went out. This threw me into some form of crazed insanity the likes of which have not been seen for a while. With the coffee maker and all the lights out on this here gloomy april day I set about on some busy work, I put my textbooks away and cleaned the bookshelf, and then with time still standing still I decided “f this noise” and pulled out the handcarders. I recalled a bag of locks that Amy had given to me during the spinning day leftover swap. The locks themselves have a fair amount of VM in them and they are severly felted in some areas but free locks will not be over looked. I started picking and teasing. And as i did…. 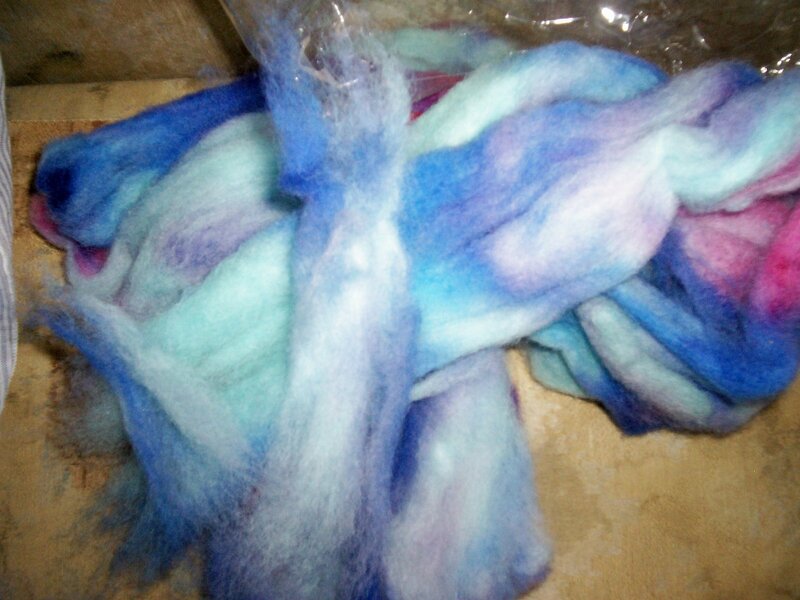 I remembered that in the roving stash lay this, 110 gr of similarly dyed romney. 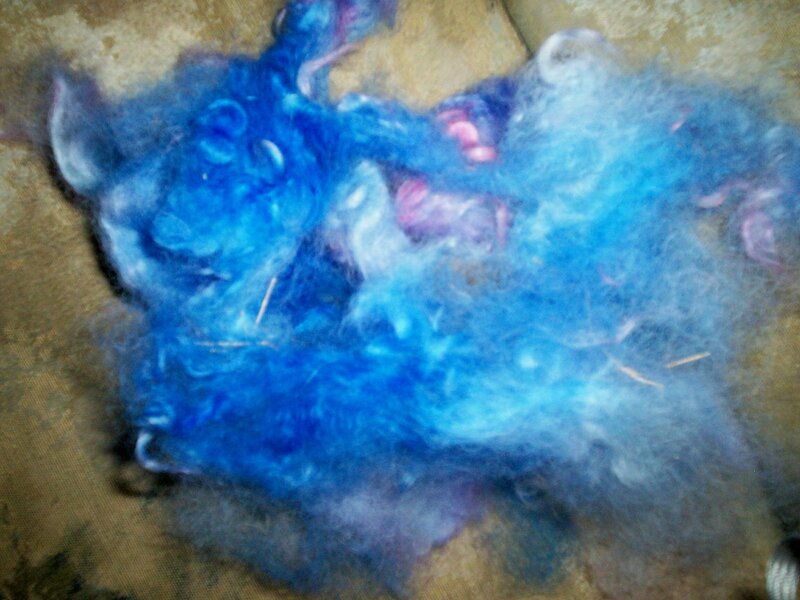 The great workhorse of spinning fibers. I got it out and compared the colors, they were nearly spot on, having come from the same place this didn’t shock but made me happy. I set about carding the two together at a 80/20 split in favor of romney, as I didn’t know how the locks would look with it. The conclusion: fabulous. The deep blues and hot pinks were netrualized a bit and in some cases gave a purple hue that is very nice. I’m not usually a blue/pink person, I like hard colors, generally, or heathered greys and browns. 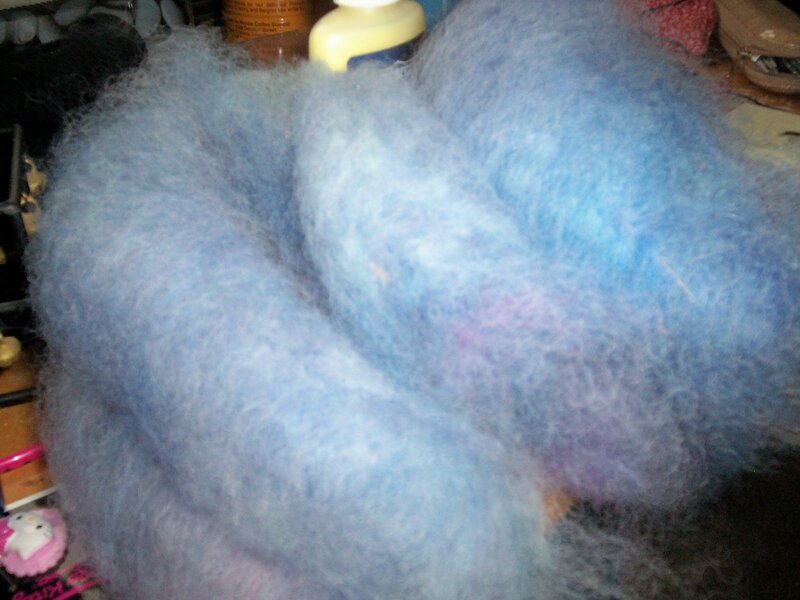 It’s carding up fabulously, and I’m guessing it will spin with ease. 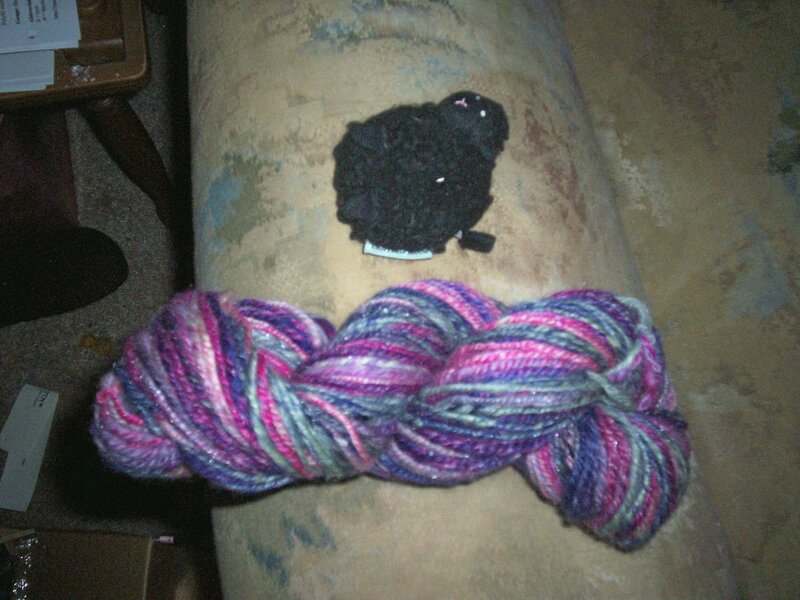 It will however take a while as after the power came back on I had about 10 rolags and made barely a dint in the bags of fiber. This could be a lenghty process. 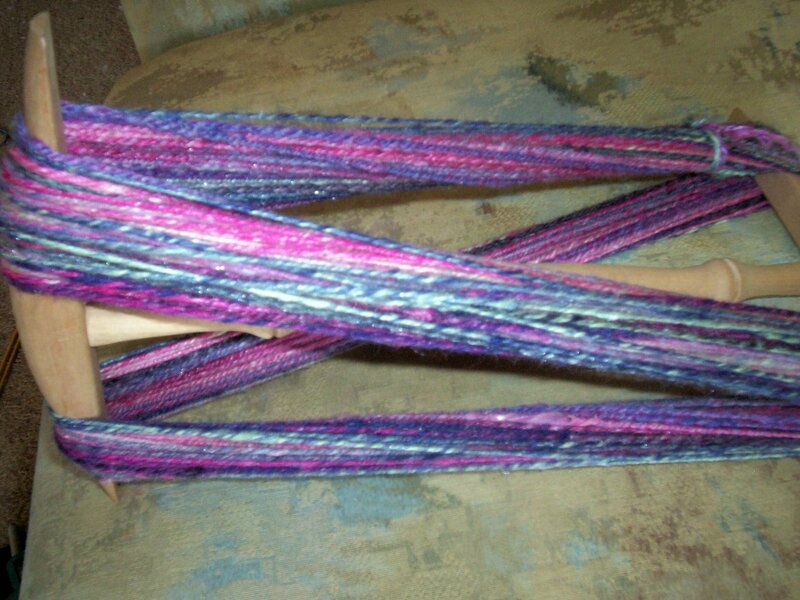 Okay lets start this off with HANDSPUN, I started this on the drop spindle when lana was here and then put it on the wheel last weekend at the spinning day, and I plied it yesterday and thusly, a skein of prettyful yarn with a bit of sparkle and loads of fun. I hand carded the rolags for a kind of heathered run look. Minimal glitz but enough. 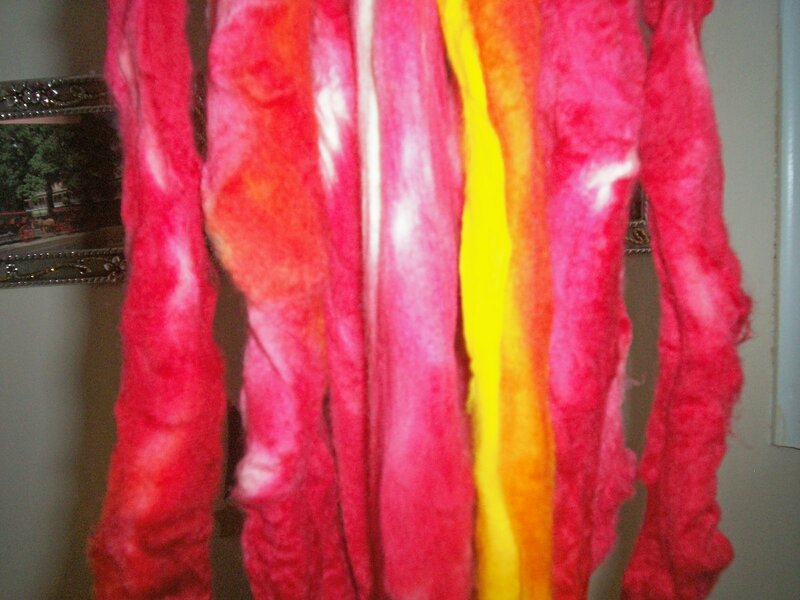 Now I had to dye a pound of roving for the spinning day so I took pictures, because well I was bored when waiting for the stuff to do it’s magic. 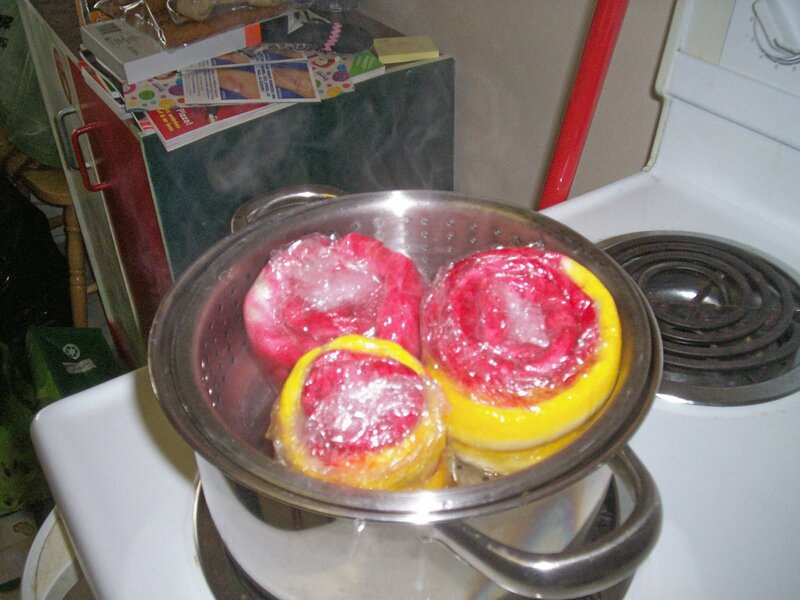 First off it all had to be soaked in its stuff for optimum absorbtion. I went with Deb Menz’s instructions. Here are some packets in the steamer, I did them in approx. 1 oz. intervals. this was the red orange yellow set, there was a blue green black yellow set as well. I got three packets in my steamer at a time and it served well. While I waited for the steamer to do it’s magic I preped the second set and let them absorb prior to packeting them up for the steamer. 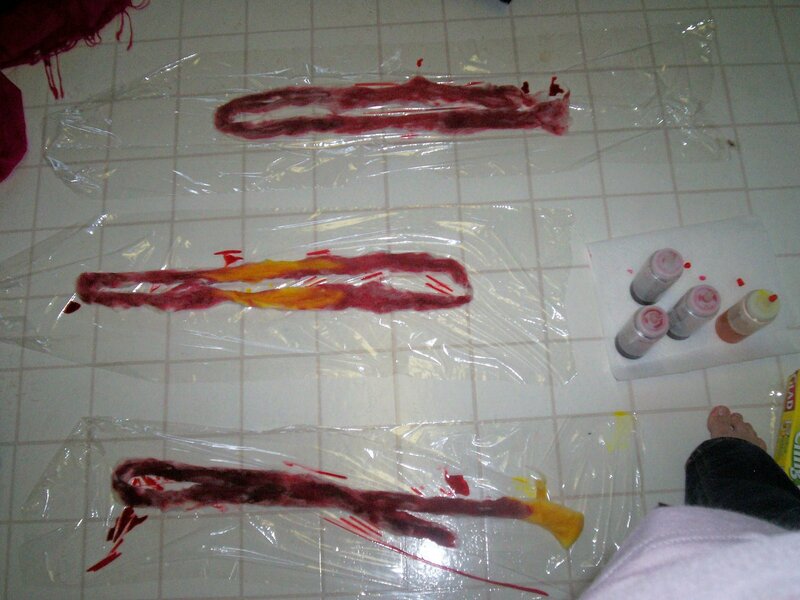 (And for the record magic eraser does remove dye from lino – just sayin). 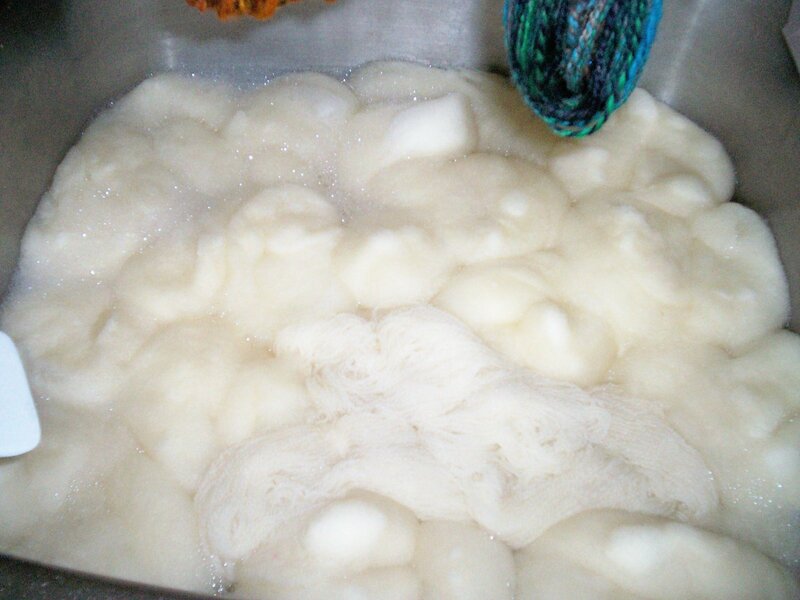 And when they were done it was hang to dry overnight. Which left my place looking like a yarn harem. I think people enjoyed the colors. I myself didn’t really like the red yellow, too bright for me, but it worked. I did however fall in love with the blue colorway, it was nice. The black took forever to wash out, and even after a good hour it probably still will bleed when they set their stuff. Tis the downfall of black I guess.